A couple of days ago, I came across a very interesting piece of news on Gizmodo. 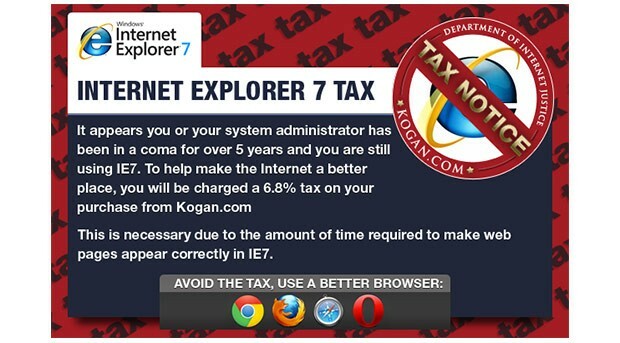 Apparently, an Australian online retailer, Kogan.com, has decided to charge a 6.8% tax on customers using Internet Explorer 7. As a web developer myself, I can understand the theory behind this tax. When designing websites, the developer needs to make sure the user experience is the same for all browsers. For this, generally, I load the website on different browsers to make sure before I launch it. The majority of errors occur on old versions of Internet Explorer. The older the version, the more distorted the website gets! To rectify those errors, a lot of time and effort goes into making sure the user experience is seamless. So if I had a choice, I would completely exclude testing and developing for Internet Explorer. It would use up less time and effort, and end up costing the client less amount of money. Therefore, if the client has to pay extra to make sure the customers using old versions of IE get the same experience as everyone else, it makes sense to pass the extra costs to those customers. This extra amount should not be equally passed on to all customers. It should be specifically charged to those for whom this extra expense is being made. It is similar to the checked baggage policy being enforced by airlines. If a passenger checks in a bag, he is charged for that bag while a passenger who only uses a carry-on bag is exempt. In the same way, the extra expense incurred by a client for users of older versions of IE, should be incurred by the customers responsible for it. Hopefully, this model of taxation will be followed by more retailers and it will cause more users to keep their browsers updated. In fact, I would personally prefer if users used Google Chrome, Mozilla Firefox, Safari or Opera, anything but Internet Explorer!